Our e-waste recycler (located in Wellington, New Zealand) currently receives about 1000 laptop batteries each month - then every two months they ship them off overseas to be processed back in to their constituent elements. My experiment indicates 75% of the cells are better than 1400mAh. I'd like to see if I can reuse the cells here in Wellington. The downside of using old cells is I don't know how they were treated - so I don't know how much life they have left. Li-Ion cells can be recharged between 500 and 5000 times depending on how hard they are charged up and discharged. If you charge a Li-Ion cell only up to 80% of it's rated capacity and discharge it down to only 40% it'll last a lot longer. Whereas if you charge to 100% and run the cell to "flat" you'll be getting only 500 recharge cycles out of it. That's the downside of reusing recycled laptop batteries. They're probably near the end of there life even if they do have half-decent capacity. So any battery pack made with them will have a much shorter life than new cells. Battery University has more complex and much less clear-cut picture of the situation. I now have enough data to produce a reasonable look at the relationship between capacity and internal battery resistance (ESR). I measured the ESR with an iCharger 1010 and the capacity with iMax B8 and iMax B6 clones. These 217 cell pairs do not include a small number (less than 10) of cells I did not measure because they had leaked. 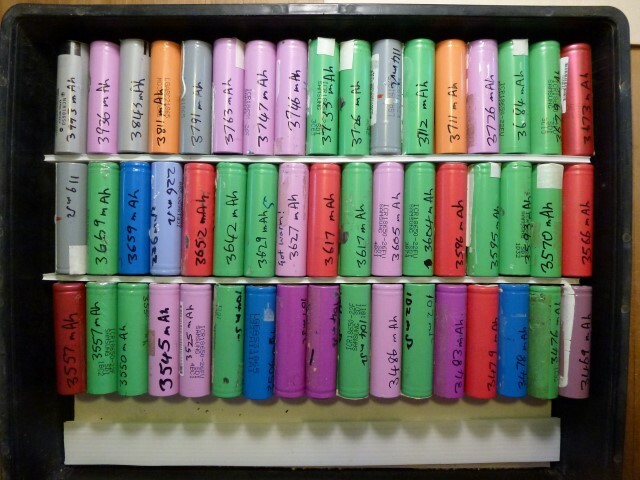 And I've excluded single 18650 cells (about 70), and 42 "good" cell pairs that I've already used in my Enviromower. So there is a strong statistical correlation between capacity and ESR, but with enough outlayers to make the relationship for an one battery "sketchy". My current plan is to discard (re-recycle) any pair of cells that have a higher than 125 mOhm internal resistance and lower capacity than 2000 mAh. That would leave me with 173 pars (80%). Here's my capacity results from the first 378 cells of (actually 183 pairs of cells) that I have charged and discharged to get internal resistance and capacity measurements. Bear in mind that my iMax B6 is not very accurate so as much as a quarter of the cell readings could be 10% out. The rest of the cells have been measured with the iMax B8 and iCharger 1010 which seem to be at least calibrated. So I'm assuming they're more accurate. The sensible option would be get rid of anything below 1400 mAh (take them back to the recycler). Or I could use them for low importance projects... like...hmm? Next I'll collate the data on internal resistance and see what correlation I can find. I've already noticed a lot more high resistance (above 300 mOhms) cells in the low capacity cells in my collection. That's why I now prioritise the lowest resistance cells for capacity testing first. The high resistance cells can wait till last. After spending a lot of time charging (and discharging) cells to measure internal resistance and capacity I finally had a day off to build up the Enviromower battery pack. It's currently without a BMS - but it works! More testing this weekend. 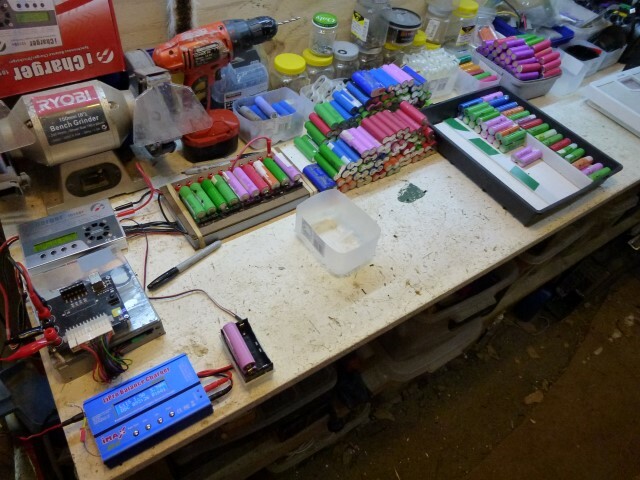 This is my work space with varous piles of cells at different stages of charging/discharging. I've kept the cells in their pairs (from their laptop configuration) to speed up the charge/discharging characterisation process. And it means they still have nickel strips for easy soldering. Middle left is my silver iCharger 1010B+ charger with a 10s battery holder craddle. This allows me to balance charge 10 pairs at a go (that's 20 cells at once). It takes about 24 hours to complete. I use this to measure the internal resistance of each cell pair too. Bottom left is a cheap blue iMac B6 charger which is used to discharge a singe pair to 3 V and measure it's capacity in mAh. This is my current bottleneck. I've got another 3 on their way from China. Here's my draw of characterised cells - ready to be used in a project. 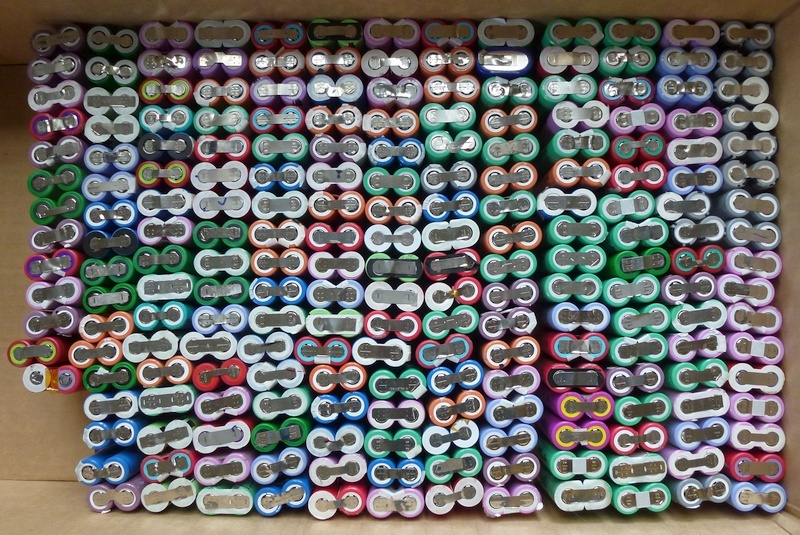 I sellected out my 51 (almost) best cell pairs - ranging from 3469 to 3993 mAh capacities (roughly 1800 mAh per cell - not too bad for used cells). I'll use these for the Enviromower pack. I culled 8 pairs which had an internal resistance above 100 milli-Ohms. I'm hoping that's an OK threshold. A rule-of-thumb is that any cell resistance below 250 milli-Ohms is considered good, and below 150 is excellant. Given that these are two resistances in parallel then if each cell was 200 mOhms the result is a 100 mOhm pair. So any pair below 125 mOhms is potentially two 250 mOhm cells (ie "good"). I might start culling any pair with higher than 125 mOhms from the rest of my collection. Then I took the 42 best pairs and arranged them into groups of 6 pairs each in such a way that they all had a total of 21.8 Ah of capacity. Here's a clump of 6 pairs being soldered together. And the end result: 12 cells in parallel strung in 7 series groups (12P7S) packed inside the old Enviromower battery housing. 25.2 volts nominal, 21.8 Ah capacity. 2C rating of around 40 Amps. About half the weight. I'll hook up a watt meter when it's in use to see what's going on when the mower is running. I've created a 3d printable battery holder for 2 x 4 pairs of 18650s, (82mm x 82mm) available on Thingiverse. This allows me to slap together 8 pairs of cells into a cube-ish block, which can clip on to the next block, so I can make up a much larger pack. I'm using my old iMax B8 charger (which is not very accurate and seems to over charge - so I don't like using it to charge) to discharge individual cell pairs down to 3.0V in order to measure capacity for each pair. I've seen other chargers go down to 2.5V but I'm reasonably happy that it's only going to 3V. From the discharge curves I've seen for several 18650's the power drops off steeply after 3V so I'm not missing much. 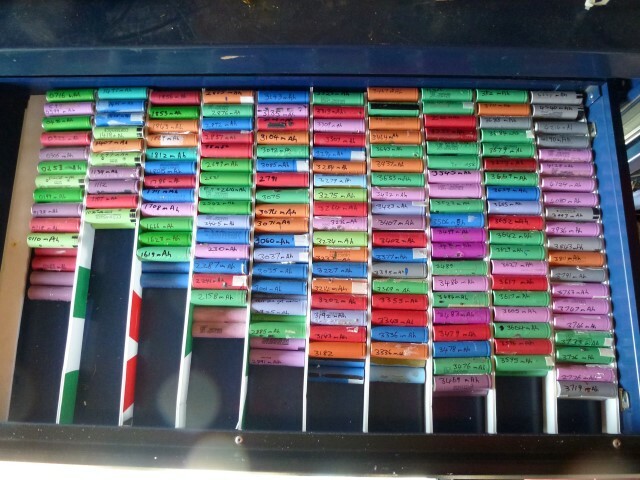 After discharging the cells I write it's capacity on the cell and sort it with my other capacity rated cells. This is now my main bottleneck. I'm considering buying a few more iMax B6 (cheap chinese copies) so I can be discharging multiple cells at the same time. My hope is that the variance between iMax B6/8 chargers will not be too great. I can buy iMax B6 chargers for NZ$27 via Aliexpress so to do four cells at a time a could buy four B6's for $108. Which is not bad. The other option would be put together a custom 4 way batch discharger with an arduino and some 10 Watt 2 Ohm resistors (or fancier constant current loads). But that would take a bunch of design time and probably end up costing in the $100 ballpark. So no great time/cost benefit. Once I've finished charging all the "raw" cells I'll use it to recharge the discharged cells. The clone iMax B6 charger says it can discharge at 2Amps - but I'm not seeing it. I've also seen comments that it is software limited to discharging at 5 Watts - which makes sense because it seems to be using a 2 Watt discharge resistor. So for a 4 volt battery that would be 1.25 Amps. Also I did a side by side run against my iMaxRC B8 Pro and the "clock" showed a 5% difference. So the capacity on the B6 is probably way off. I'll try a comparison between all three and a real clock next to see what the variance is. There's an open source version of the B6 firmware available that makes it easier to calibrate - so I might have a go at that. I might also see if I can upgrade the discharging FET and resistor so that it can really discharge at 2 Amps (8 Watts). Here's the iMax B6 schematic with the dummy load section highlighted. David Jones did a tear-down of this charger on his EEVBlog. 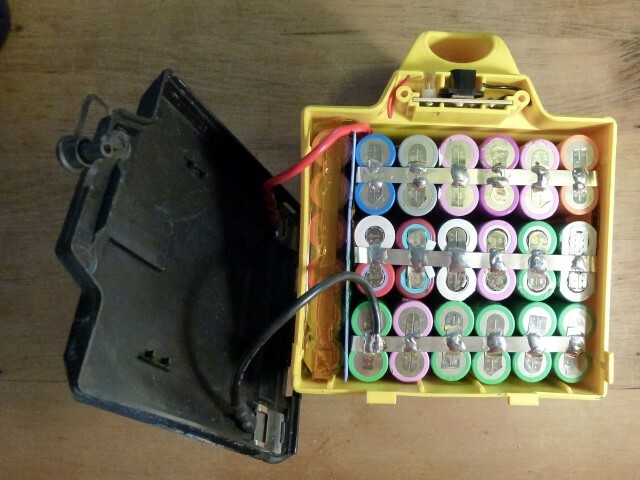 I've made a 10 slot 18650 holder for charging the batteries I liberated from discarded laptop. I currently have about 500 cells to charge - mostly still in pairs. Most HP/Lenovo/Toshiba laptop battery have 6 cells each in 3 pairs. I've kept the pairs together so I can charge the cells in pairs - thus halving the number of charges I need to do. By balance charging 10 pairs (in series) at a time I can do 20 cells in one "run". That means 25 runs to do 500 cells. My iCharger 1010B+ charger can cope with 10A max so my plan is to charge the cells at 1 Amp each (roughly 1/4C - nice and gentle) overnight. 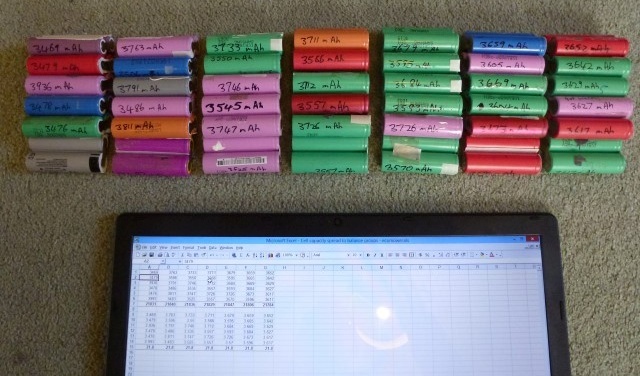 Inside a standard laptop battery there is usually six "18650" rechargeable Li-Ion cells. When a laptop battery dies - it's normally because 1 or 2 cells have "mostly died" - the rest are fine. I've been pulling laptop batteries open and testing the cells - almost all I've found have been recoverable. They probably won't hold as much power as they did went they were new - but still plenty to be useful. stuck 4 into an empty USB power bank - this has worked really well. It uses about 10% of it's charge to recharge my phone. Open battery cases and separate cells into pairs. Usually 6 cells per case. Approx 2 minutes per case. 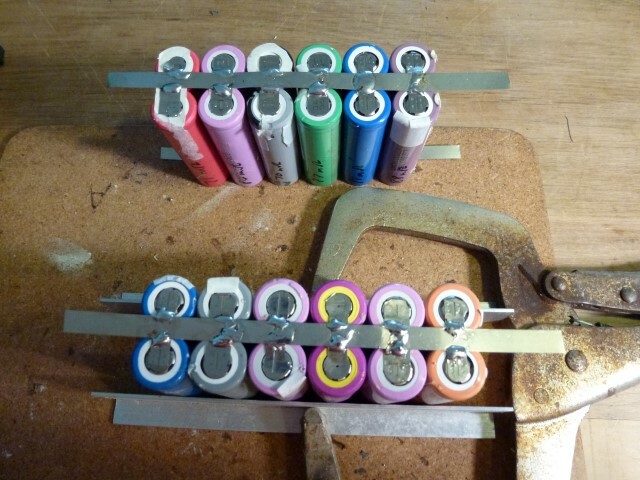 Measure voltage of cell pairs (no load) and sort into piles; 0V, 1V, 2V, 3V, 4V. Approx 5 seconds each, 100 in 10 minutes. Starting with the highest voltage pairs - balance charge on iCharger and then read the ESR (equivalent series resistance) for each pair. Write that on each pair. Approx 24 hrs per 10 cell pairs. Sort the pairs from lowest ESR (best) to highest(worst). Discard (take back to recycler) any pair with ESR higher than 125 mOms. Starting with the lowest ESR pairs - discharge each cell pair to 3V on iMax B8/B6 and note capacity on cell pairs. Discard any pairs with capacity lower than 2000 mAh. Select number of cells required for project. Sort into evenly matched groups. Join groups together to make a pack and add balance wires. Test it works. Add balancing BMS with thermal sensor. Test it. Package up the whole pack. Final balance charge with balance charger. More use and recharge testing.